Scott Wunder of WunderWoods does wonderful things with urban wood. Based in St. Charles, MO, Wunder not only creates custom woodwork, he saws logs from local trees he salvages and authors a a regular blog chronicling his business, selected cool custom projects and how-to do stuff, like choose a wood finish. His writings rarely fail to include a good dose of humor. 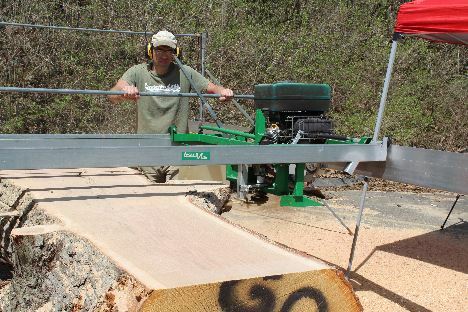 Such is certainly the case with a blog Wunder posted on New Year’s Day titled, Lucas Sawmill Is Small But Mighty.” It delves into how and why he chose to purchase a Lucas sawmill made in Australia and how he uses it. This is what he writes about his initial reaction to his investment. Wunder’s opinion soon changed after he set up the Lucas in his backyard. Click here to read Wunder’s blog.